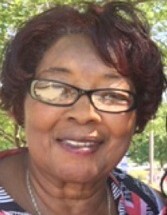 Mrs. Francine Culbreth-Carter, age 79 of 4120 Huckleberry Road Fayetteville departed this life on Saturday, March 30, 2019. Funeral Services will be held on Saturday, April 6, 2019 at 2:00 PM at the Kingdom Hall of Jehovah Witness on Cumberland Road. Burial: Cumberland Memorial Gardens. She leaves to cherish and honor her memories; husband; Robert Carter, one son, Steven L. Carter; two daughters, Michele Carter-McCrimmon, Deborah A. Cogdell, two step children, Lawrence M. Jones and Shirley Bragg, two sisters; Mary Cogdell and Queenie C. Kelly, eight grandchildren and a host of other relatives and friends. There will be a viewing Friday, April 5th from 2:00 PM to 7:00 PM at the funeral home.